Starting with 1968's "Frances Albert Sinatra Does His Own Thing," Carroll appeared wearing Travilla in numerous variety style programs where she entertained millions with her incredible vocal talents. 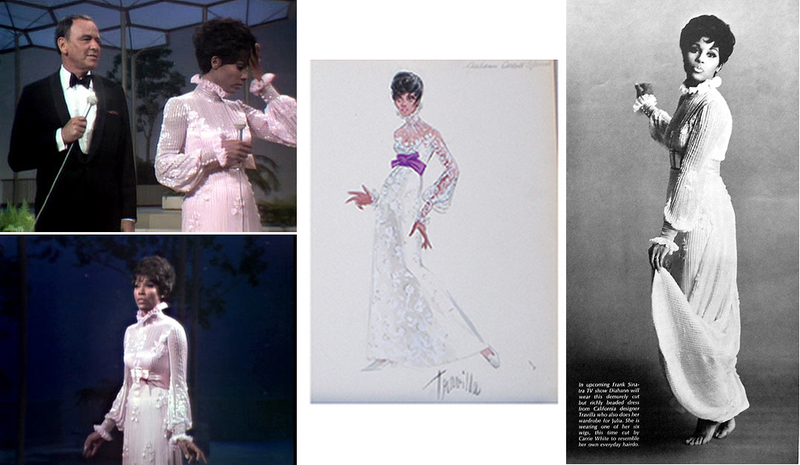 Screencaps from Sinatra special along with sketch and photo from LIFE Magazine. 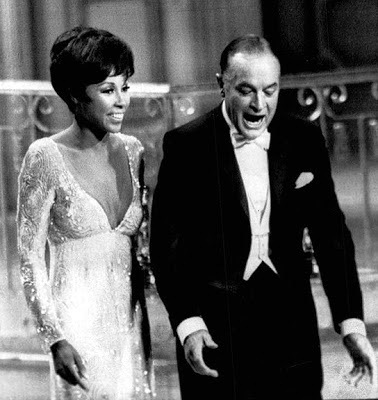 With Bob Hope in unknown appearance. 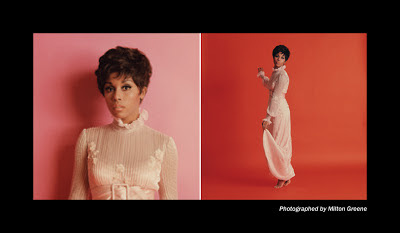 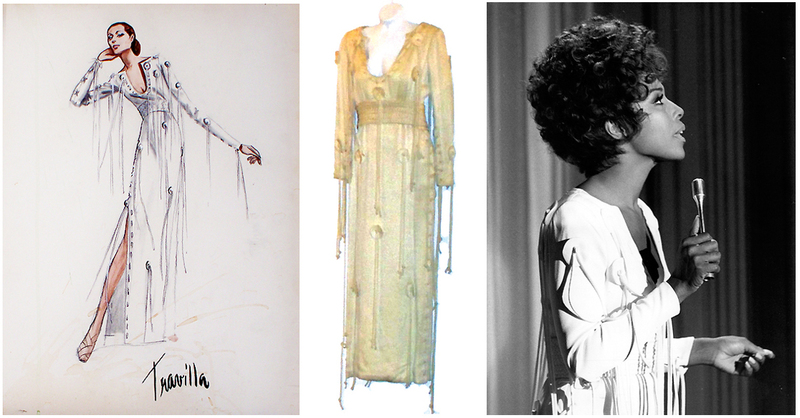 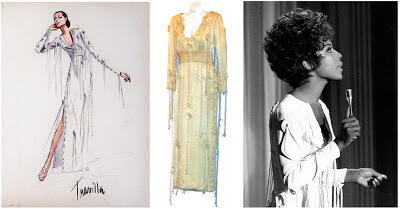 In April 1971 she headlined "The Diahann Carroll Special" which included an extraordinary fashion show with Diahann in gowns by Travilla, photographed in a cotton field in Bakersfield, at the Watts Tower, on Spring Street in downtown Los Angeles, and at the Descanso Gardens set to the tune of "If My Friends Could See Me Now." Most probably from her 1971 variety special. Two variations for Travilla's private label. 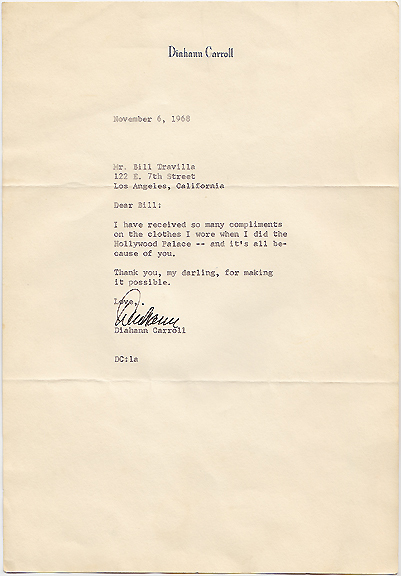 "The Hollywood Palace" was a variety series taped before a live studio audience at the Hollywood Playhouse near Hollywood and Vine. 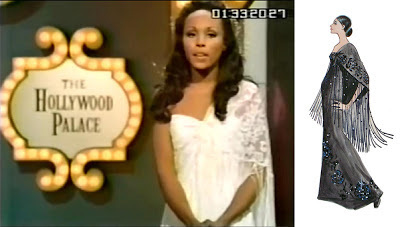 Over it's five-year run, Carroll appeared several times as a guest and twice in late 1969 as hostess. Carroll sings with Perry Como wearing a red velvet and jeweled version of the "Julia" dress. 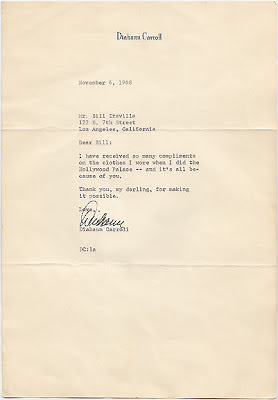 Letter from Carroll to Travilla regarding her Palace wardrobe from a 1968 appearance. 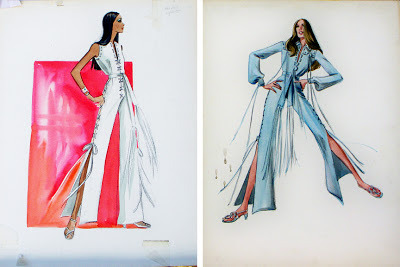 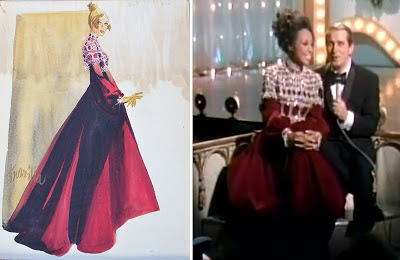 Their close friendship was also quite evident on a 1979 episode of "Dinah" devoted to Hollywood glamour sharing a laugh over the story of him bringing his entire new line to her house to choose something for her appearance and Carroll instead deciding to wear an outfit from one of her shows a decade before. 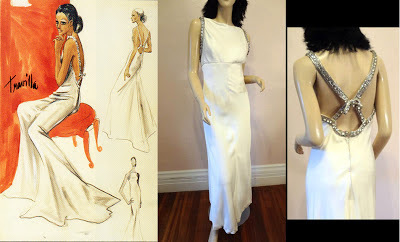 The retail version of a gown created for one of Carroll's specials.